POINT PLEASANT, W.Va. — Drug abuse, including the abuse of prescription painkillers, has reached epidemic proportions in the U.S., and Fruth Pharmacy, based here, is on the front lines of the fight, says Lynne Fruth, the company’s chairman and president. Along with West Virginia, Fruth has stores in Ohio and Kentucky, all of which have been hammered by the growing crisis. (5th from left) at the launch of the Bridge of Hope Fund. 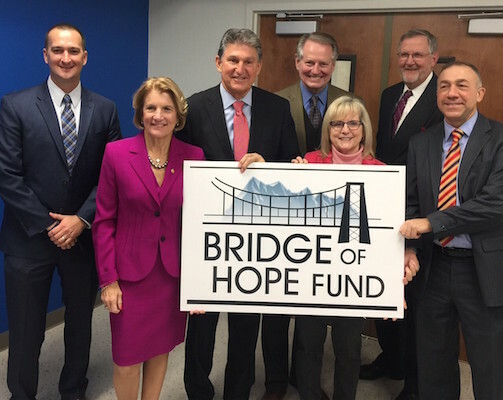 Fruth began discussing the idea of Bridge of Hope with leaders from the health departments of Charleston and Huntington, Recovery Point and The Greater Kanawha Valley Foundation. Fruth also reached out to friends and business associates in the pharmacy industry and members of the National Association of Chain Drug Stores to ask for their support. In response, Walgreens and Cardinal Health have each committed to a matching donation of $20,000 to the fund. Cabell Huntington Hospital Foundation has committed another $20,000. “We’re at Ground Zero in West Virginia with the drug epidemic in our country,” Fruth says. “Fruth Pharmacy has worked with several facilities, provided scholarships, and followed success stories of how people have been able to overcome their addictions and be restored to their families and a better life.” In Fruth’s view, the key to complete recovery is to bridge the gap of training and education needed for people to secure meaningful employment, which in turn makes them feel better about themselves, and helps them to become active and contributing members of society. Fruth has also been active in Harm Reduction Programs, supported syringe exchanges, and trained pharmacists in the dispensing and counseling for the sale of the overdose reversing drug Naloxone. For several years, Fruth has provided scholarships for graduates of the programs at Recovery Point — some $800,000 over 30 years. Some of these programs Fruth supports and participates in, such as providing clean needles to addicts, are controversial, but Fruth believes that they are not only helpful but pragmatic. Dirty syringes provide an imminent public health hazard, such as the spread of HIV and hepatitis C, especially for those in close proximity to the user. And because of the dire financial straits of most of those addicted, the many tangential costs associated with the spread of disease fall on taxpayers. As Fruth points out, those in the hell of addiction are also disenfranchised from public services, such as receiving any type of health care or assistance, and offering clean needles is a way to get them back in. Along with providing clean needles, addicts coming in to exchange needles receive counseling from recovery coaches, health screenings and, for those who are not pregnant, long-term birth control. The Bridge of Hope Fund will help individuals who are in sustained recovery with job training or help them receive a traditional college degree. The Greater Kanawha Valley Foundation will administer the fund and the application process. Training is available in trades such as carpentry, HVAC and welding or certification in such areas as cosmetology or massage therapy. Scholarships for community or technical college and university courses is also available. Fruth says she is proud to have two senators, Manchin, a Democrat, and Capito, a Republican, working together for the good of the state on issues such as drug abuse, especially in light of the severity of the crisis, which Fruth believes will only get worse before it gets better.